Does your skin become red and irritated after using a new skincare product or coming in contact with certain metals or chemicals? If so, you may have experienced contact dermatitis. Most people have experienced contact dermatitis at some point in their lives. It occurs when your skin comes in contact with a foreign substance causing your skin to react by becoming red, irritated, and often itchy. While the reactions are often unpleasant, contact dermatitis is typically never severe and symptoms often subside in a short period of time. When your skin comes in contact with an allergen, you may not get a rash the first time you touch it. But one touch can make your skin more sensitive causing a reaction the next time you come in contact with it. When did you first notice a reaction? What were you doing when the reaction started? Is the reaction triggered by a certain activity? An allergist can help determine the exact cause of contact dermatitis through more testing. A patch test exposes a small patch of skin to an allergen, typically on your back, to see if your skin reacts. The allergen is kept on your skin for a specific period of time, usually around two days. If a reaction occurs, an allergist can determine the likely cause of your contact dermatitis. If you discover you have an allergy to a specific substance, you should avoid contact with the allergen. For example, if it’s determined you have a nickel allergy, you should avoid wearing jewelry containing nickel. You may need to get a new pair of eyeglasses without nickel or cover your cell phone to avoid metals. If a reaction occurs for other common allergens such as latex gloves and skincare products, avoid use and switch to alternative solutions to avoid further rashes or symptoms. If you develop contact dermatitis, symptoms often go away on their own after exposure to an allergen is removed. Keep the skin clean and apply anti-itching creams such as hydrocortisone or calamine lotion to alleviate symptoms. A steroid cream may be prescribed when common over-the-counter treatments don’t offer relief. 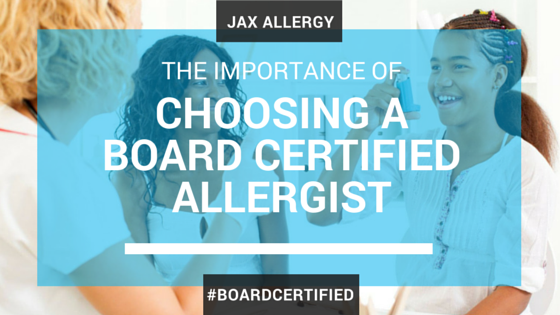 If symptoms persist, contact your allergist for the best treatment options for you. Are you suffering from contact dermatitis? Learn the cause of your symptoms through allergy testing. Contact the Allergy & Asthma Specialists of North Florida for more information.